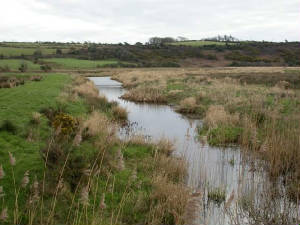 Habitat: Reedbed and scrub, with freshwater pools. Main interest: Breeding and passage warblers, Water Rail; breeding seabirds and Choughs on nearby cliffs. Scarcer species & rarities: Gadwall, Goshawk, Hoopoe, Scandinavian Rock Pipit. 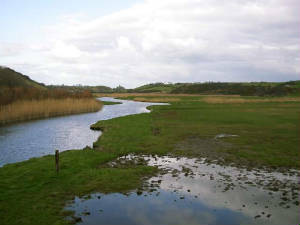 Access: The area can be viewed from the roadside which runs along the west side of the main river as it flows into the sea just east of Annestown village. A number of pathways provide limited access, but beware deep pools or marshy areas. Further details: The reedbed and scrub along the river valley here provide abundant nesting habitat for Sedge & Willow Warblers, and other warbler species nest or pass through in smaller numbers. Potentially this could be a site for rarer migrants. Some of the marsh habitat and pools here have been constructed to help improve water quality along the valley. Water Rails, Little Egrets, Mallard and Mute Swans are regular throughout the year, and additional duck species can occur in winter. Choughs, Herring Gulls and Fulmars nest along the cliffs at Annestown beach, or immediately east and west of here. Hoopoes have occurred on a number of occasions, most recently a bird in March 2003.